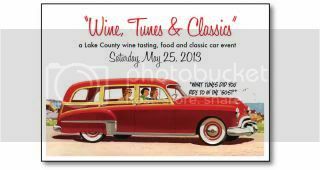 Next Saturday, May 25 - head over to Lake County for some wines, foods and classic cars. "Wine, Tunes & Classics" looks like a good event to check out. I really like their graphic - with the vintage 50's feel. Interested in vintage fashion? May 21st at the Tsakopoulos Library Galleria you can check out a 1940's fashion show as part of the Capital Decades series. It starts at 6 pm and is a free event - but you have to register to attend. If you are a Pink Floyd fan and want the ultimate cover band experience - check out "Brit Floyd" at the Community Center Thursday, May 23 at 8 p.m. They've gotten amazing reviews - so it might be worth the $42.50 for Pink Floyd super fans. I'd be more inclined to just play an old record or two - but I thought I'd share anyways.